In this day an age it can feel like nobody agrees on anything. From breast feeding to Donald Trump-isms and the crossover in between, it seems like we are constantly picking sides of divisive issues and arguing with the other. But there are a precious few things on which we can all agree, like wanting our kids to be healthy and knowing that parents have a strong influence on their children. "If this trend continues we’re going to have children who are dealing with type 2 diabetes, high blood pressure and heart disease in their 30s"
"If this trend continues we’re going to have children who are dealing with type 2 diabetes, high blood pressure and heart disease in their 30s," said Natalie Lambajian-Drummond, MD (affectionately called "Dr. Natalie" by her young patients), owner of Whole Child Pediatrics in Yorkville, IL and recognized as one of the top pediatricians in the nation by Parents magazine. "We’re heading toward a health crisis if we don’t turn this ship around." Many people - both medical professionals and parents - are saddened but not surprised by this latest report of the declining health of American children. "I think [this report] is both really sad for me to hear as a parent but also pretty predictable given the lifestyle choices that we as parents are making for our kids," said Gene Oh, President of BikeHub and Owner of Alameda Bicycle in Alameda, CA, a part of the My City Bikes alliance of beginner-friendly bike shops. "I think it also gives parents an extra push to take fitness for themselves and their kids seriously." The most common cholesterol problem that the children in the report had was low HDL cholesterol, meaning they did not have enough of the "good" cholesterol compared to the "bad" LDL or non-HDL cholesterol. "You want to make sure that you get the HDL levels high for its protective benefits," explains Dr. Lambajian-Drummond. The Centers for Disease Control and Prevention (CDC) reports that 21.3% of adults aged 20 and over had low HDL cholesterol . The NCHS findings reveal that today, 7.4% of American kids age 6-19 have the same problem. "If we don’t stop what we’re doing and really teach our kids how to balance their lives are we going to be the generation that watches our children go through these debilitating diseases at a younger age?," Dr. Lambajian-Drummond said. "Will we be going through that together? Are we going to have heart attacks at the same time? That’s just not the order of life. I see so many kids developing chronic diseases at a younger age and so much of it can be reversed with just basic lifestyle." "The two most important things are having it be fun and having parents participate because kids are going to model our behaviors and interactions," said Oh. He and his colleagues at Alameda Bicycle host family cycling clinics to teach young children how to ride and get parents involved in the process. They’ve figured out a simple but magical combination that works to get children healthier: make it fun. 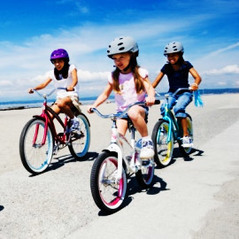 "A kid can ride a bicycle by himself, with friends or with parents which provides great means for anyone to use bicycles as a tool for fitness. 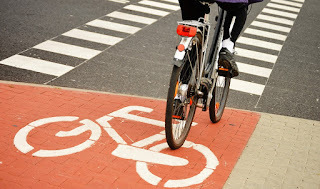 We’re hoping to flip it around so while giving kids the enthusiasm and joy of cycling we can also get the parents to turn around and make changes for themselves, too." "The physical health benefits of biking are clear, but it’s so much more than that," said Dr. Lambajian-Drummond. "Sometimes the only real conversations that parents are having with their kids these days are when they’re driving them to and from different things in their lives. It’s really sad to me that we’ve gotten to the point where the parents are so overworked and the kids are so over-scheduled that there’s really no time to connect and be together. A bike ride is a great way of pulling away all those distractions - you can’t check your phone when you’re riding your bike! - you’re forced to be with the people you’re with and that has health benefits beyond just the cardiac and muscular benefits [of biking]." Big changes like reversing alarming trends of declining child health start with small steps. Simple things like eating more fruits and vegetables and biking together helps build healthier families on every level. "Doing family bike rides and just carving out that time shows your kids they’re important to you," said Dr. Lambajian-Drummond. "Kids are monkey-see-monkey-do, so when you have a parent who’s saying, 'we’re going to go on a family bike ride and make this a regular thing,' not only does that give them that one-on-one time so they can build that bond and open up lines of communication, but it also gives physical health benefits." "I do pediatrics because my goal is to try and prevent future illness," said Dr. Lambajian-Drummond. Parents can take an active role to do the same by being more physically active together as a family and modeling and expecting healthy food choices. For guidance on whole family nutrition visit http://www.nutrition.gov/life-stages/children to find resources, recipes and ideas. For information about local family bicycling visit http://www.mycitybikes.org/ for local beginner biking guides to over 300 North American communities. 1. Nguyen DT, Kit BK, Carroll MD. Abnormal cholesterol among children and adolescents in the United States, 2011–2014. NCHS data brief, no 228. Hyattsville, MD: National Center for Health Statistics. 2015. 2. Carroll MD, Kit BK, Lacher DA. Total and high-density lipoprotein cholesterol in adults, 2009–2010. NCHS data brief no 92. Hyattsville, MD: National Center for Health Statistics. 2012.